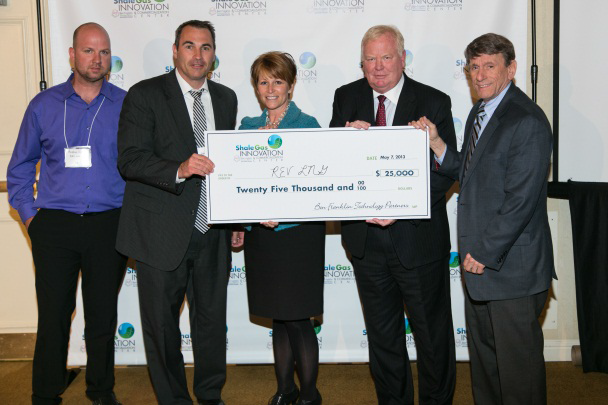 Ben Franklin's Shale Gas Innovation Competition Announces Winners! 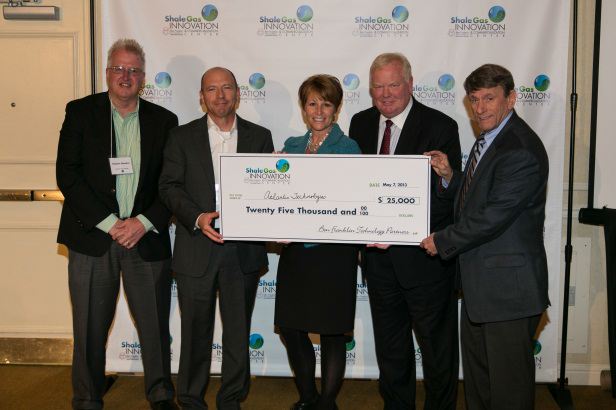 STATE COLLEGE, PA - On May 7, 2013, the Ben Franklin Shale Gas Innovation & Commercialization Center (www.sgicc.org), an initiative that identifies and helps commercialize technologies that enhance responsible stewardship of the environment while creating jobs in the Commonwealth, announced the three $25,000 winners of their Innovation Contest. Developed the Radial Deionization System (RDI), which is ten times the speed, fifteen times the range, and less than half the price of previous technologies that deionize produced water from oil, gas, and mining operations. For more info contact Patrick Curran at pmcurran1@gmail.com or 949-302-5265. Developed a catalyst technology for natural gas conversion to synthesis gas that has higher activity, longer life and the ability to operate under conditions that save capital and operating cost. The Company also engineered a method for utilizing the process heat so it is not wasted. For more info contact, Jeffrey Harrison at jbharrison@pyrochemcatalyst.com or 919-349-7145. The Company has contracts to source and transport liquid natural gas (LNG) via LNG transporter tankers which become a virtual pipeline to end user customers. At the customer yard, REV LNG supplies a mobile fueling station to hold the LNG and to be used in a traditional self-serve fuel dispenser. For more info contact Dave Kailbourne at edk@revh2o.com or call 810-599-1274. The event concluded with congratulatory remarks made by Sheri Collins, Executive Director of the Technology Investment Office at the Pennsylvania Department of Community and Economic Development (DCED). Sheri commented, “Innovations such as those presented here today are exactly what we need to continue to increase job creation across Pennsylvania. 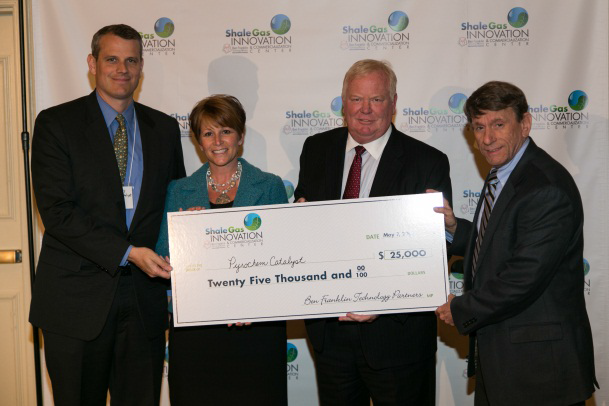 On behalf of DCED Secretary C. Alan Walker and Corbett Administration, we applaud all who put forth the effort to submit applications to the Shale Gas Innovation Competition. This year’s contest was co-sponsored by Ben Franklin Technology Partners (http://www.benfranklin.org), ANGA (www.anga.us), Acorn Energy (http://acornenergy.com), Cabot Oil & Gas Corporation (www.cabotog.com), CONSOL Energy (www.consolenergy.com), Chesapeake Energy (www.chk.com), The Dow Chemical Company (http://www.dow.com/), First National Bank (www.fnb-online.com ), Little Pine Resources (http://littlepineresources.com), the Marcellus Shale Coalition (http://marcelluscoalition.org), OSCOMP Systems (http://www.oscomp-systems.com/),and Praxair (www.praxair.com). The Ben Franklin Shale Gas Innovation & Commercialization Center is funded in part by the Department of Community & Economic Development and the Ben Franklin Technology Development Authority. The Ben Franklin Shale Gas Innovation and Commercialization Center (www.sgicc.org) supports and commercializes early-stage technologies that enhance responsible stewardship of the environment while properly utilizing this energy asset.